1) A lift executed from the shoulder, lifting the elbow up and over, pulling a relaxed forearm and hand along for the ride. 2) A “karate chop” recovery where the hand leads the motion, with the swimmer typically holding a lot of tension from shoulder to fingertips. 1) It relaxes the shoulders, forearms, and hands. 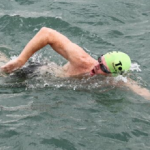 2) This relaxed posture allows for a better feel for the water upon entry. 3) Since the sides of the body tend to mirror one another, a dropped elbow during the recovery can result in a dropped elbow during the catch. 1) By placing your fingers on the water, your elbow is set at a reasonably steady height as it comes past your shoulder. 2) This means your body will have a consistent amount of rotation. 3) Consistent rotation means a balanced stroke from side to side, and better arm strokes under the water. Below I show two professional swimmers followed by two amateurs (one good and one bad). Above: High elbow recovery – front view. Notice the hand hanging down, relaxed. Above: Watch the elbow lead the hand until it passes his head. The angle flips over to the other side of his shoulder. The orange ovals show where his extended hand is during the recovery: held out front and slowly dropping into the catch. All this happens while he is rotated onto his side. This guy is good. Above: Good example of the elbow over the hand during the catch, made possible in part by a relaxed recovery. The angle from shoulder to hand is down-facing – she’s “getting on top” of the water. The body line is tapered up toward the surface because most force is being directed back. She’s a world-record holder. The GOOD amateur: The swimmer above is using a shoulder shrug, and you can see the angle flip from back to front as the elbow pulls the forearm over the top. In orange you can see the catch being made with the other arm and the elbow staying high as a result. Below, the same swimmer underwater, executing a high-elbow catch and maintaining a nice body line parallel to the surface. This is a “karate chop” recovery – what we want to avoid. He’s okay in the first frame, but the forearm and hand take over and move forward first. There is almost no elbow motion until the hand has rotated forward completely. This wastes time and it happens in part because he swims very flat, rotating his hips down too early vs. staying on his side for the recovery motion. His other arm starts to break down very early under the surface as you can see below. The red lines above show where his recovery started with a low elbow, and the red lines below show the dropped elbow catch that results. The green line shows where he could have been had he executed his recovery properly by shrugging the arm over the top. Then he would have been able to pull with a vertical forearm – ideal.